Normally we don’t share too much behind the scenes information on our blog, but today is different, we have a large milestone. 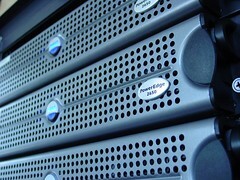 We have been working for just over a year to migrate from one hosting platform to another. Today we reached our milestone. Previously we had a datacenter in Orono. It was a nice datacenter, high voltage power, generator backup, security system, redundant air conditioning, plenty of racks filled with servers, redundant routing, decent pipe. While it was nice, we believe our current platform is even better. Our current hosting platform is comprised of virtual machines, meaning our servers are not traditional machines that you buy from Dell, HP, or IBM, but instead piece of a much larger machine that we rent. This setup gives us everything that our setup did, but gives us additional, more bandwidth, instance console access to each of servers, scalability, and great uptime. And the single biggest benefit this move gives us, more time to spend on our customers. No longer are we going to be changing AC machine parts in the middle of the night, dealing with dead UPS batteries during power outages, and replacing tired servers. Case in point, this past November, one of our clients was featured in the national news and received a rush of traffic that overwhelmed the server. I was about 2 hours away from the datacenter, but this was one of the sites that we had already migrated. The issue was fixed from my blackberry, while standing outside in about five.